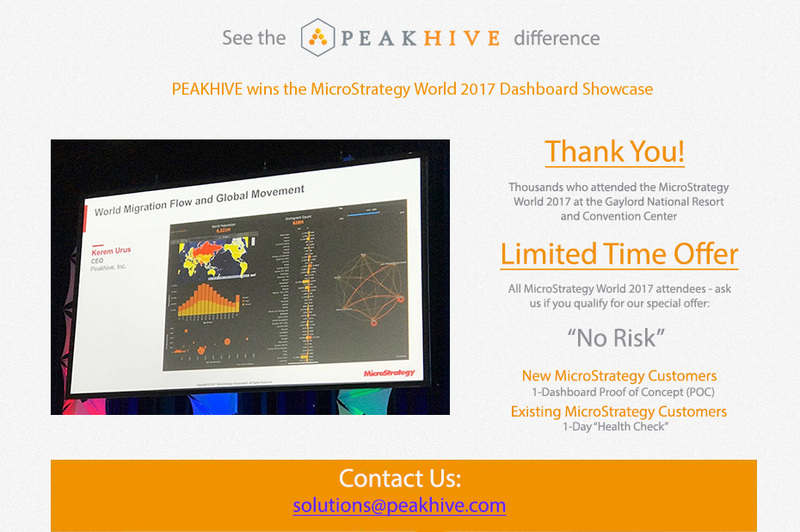 Peakhive is a consulting company that provides Business Intelligence (BI) and Adaptive Business Intelligence (ABI) services to leading companies. Our mission is to increase the effectiveness of our customers’ strategic and business decisions, without compromising their budget, by transforming data into intelligent information. Our unique “All Inclusive Health Check” methodology allows us to take a current and accurate picture of your existing environment including Infrastructure, Database and MicroStrategy implementation. Our unique and proprietary SDLC methodology and document templates allow you to visualize the end product at the “working mock-up” stage. This leads to minimized deployment cycles and eliminate delivery surprises. Our experienced and certified consultants have broad SDLC Business Intelligence expertise with virtually all versions and components of MicroStrategy. With proven ability to quickly analyze key business drivers in complex situations, we develop strategies and solutions to address your Business Intelligence needs. As a result, we generate flexible solutions for our clients, in the areas of Business Intelligence, Adaptive Business Intelligence, Data Warehousing and Project Management. Our offerings include All Inclusive Health Check Services, Short and Long-term Solutions, Full SDLC Development, and Outsourcing Strategies to better comply with our your needs.